Article Found Here, "The Morning Call..."
"State Law Gives Bicycle Wide Berth on Street"
"Q: My understanding is that state House Bill 170 dealing with bicycle safety rules makes it legal for a motorist to cross a double-yellow line to pass a cyclist. If that's correct, that means it currently is illegal to do so! That might explain why some drivers don't move over when otherwise they could. In any event, I basically support the provisions of this bill, and the measure has been signed into law by Gov. Corbett. A: By my reading of the state Vehicles Law, Terry, it's not even illegal to cross a double-yellow line to pass another car unless "do not pass" or "no passing zone" signs are posted. We've been down this road several times over the years, and conflicting traffic always comes my way in response, but most police officers I've consulted agree that the signs must be there for the provision to be enforceable. Ted Kohuth, retired commander of state police Troop M in Bethlehem and also retired as Whitehall Township police chief, is among those who see it that way. Kohuth is quick to point out that, as a matter of safety, he recommends against crossing a double-yellow to pass another car on a two-lane country road, but that as a matter of law, it's not illegal if the signs are missing. Crossing the line briefly to pass a bicycle is a model of a different color, but the same clearcoat rules apply. State Rep. Ron Miller, R-York, who introduced HB 170, said one of its intentions is to assure motorists that it's legal to cross "the center line," or the double-yellow line, to pass a cyclist, so long as it's done in the absence of conflicting traffic and otherwise safely. Miller wasn't really ready to sign on to my contention that it's always been legal to cross the double-yellow — he said he'd have to check into it — but even if that's true, the new law helps clarify the matter. "More than anything, it's going to be an educational piece [of legislation]," hopefully helping to broker a peace agreement between motorists and bicyclists, Miller said. "This clarifies that it's OK for a car, if it's safe to do so, to move across a double-yellow line to pass." It may well be that some motorists think they could be cited for crossing the line to pass a bicyclist, but given the fact that bicyclists have the same rights (and responsibilities) as motorists, it follows that if you can cross the line to pass a car, you can cross it to pass a bike, and always could. If the new law reinforces this assertion in the public mind, it will be helpful. From my limited experience riding my bike on the streets, it's not so much clueless drivers who come too close for comfort as they pass, but rather angry ones — people who are convinced that bicycles don't belong on the streets and should not be allowed there in the first place. Often, these close shaves are intentional, a sort of "I'll put a scare into this guy to show him what I think" philosophy. It gets no more small-minded than that. It's true that too many motorists tend to drift carelessly onto and over the double-yellow, into a portion of the oncoming lane for absolutely no reason, and those folks should be cited. But with legitimate cause — and of course, assuming the oncoming lane is clear and all other laws are being observed — it's perfectly safe and legal to encroach in order to pass. In the view through my windshield, the new law doesn't change that. 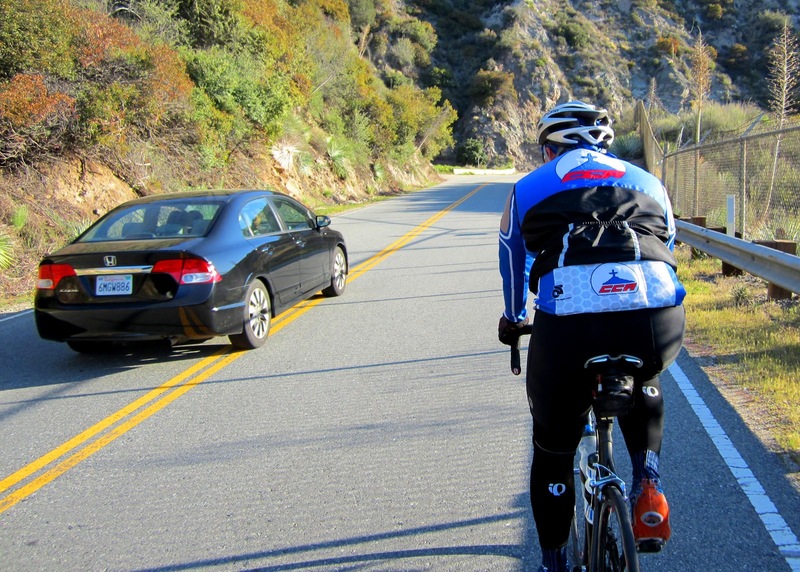 What the law does is clarify and solidify the requirement that motor vehicle drivers must give bicyclists safe clearance when passing on the road, and it unambiguously defines that clearance as a space of at least four feet. If a motorist comes so close that the cyclist can reach out and touch the car, then the law is being broken; there's no contrary argument to be made. Miller said his area's highly engaged bicycling community had been pressing for the safety measures for years. He said bicycle safety ultimately depends on mutual respect between drivers and cyclists, putting it this way in a news release: "Some motorists will try to get as close to bicyclists as possible in order to 'make a statement' because of a belief that [bicyclists] don't belong on the road, which is not the case. At the same time … bicyclists must be mindful of larger vehicles, and adhere to the rules of the road that they must also obey." It's a good law, though I'm not sure how much enforcement we can expect. Police officers will have to witness violations and take the time to issue citations. Many motorists won't be aware of the new rules, and others — the perturbed types again — won't care. Gov. Tom Corbett signed the bill Feb. 3, making it effective April 3. Hopefully the educational aspect cited by Miller will get some traction. The law makes other important changes. It clarifies and emphasizes that bicycles are allowed to be ridden not off to the shoulder, but directly in the traffic lane — the "shared lane" practice considered to be the safest by many experts. The law states that, while observing all other regulations, bicycles "shall be driven in the right-hand lane then available for traffic, or as close as practicable to the right-hand curb or edge of the roadway." This provision already exists for motor vehicles — it's meant to keep slow-moving cars from hogging the passing lane — and it applies to bikes as well since they are considered vehicles. The new law adds the provision to the section of law specifically applying to "pedalcycles," as they're called in the code. Unfortunately for shared-lane advocates, two-lane roads are exempted from the new regulation, but again, as vehicles under the law, bicycles still are allowed to be ridden in the lane itself. There's something in the law for motorists, too: It's always been advisable for courteous in-lane bikers to pull to the side and even stop if necessary to allow jammed-up motor vehicles behind them to pass. The new rules make it a requirement: "A pedalcycle operator shall use reasonable efforts so as not to impede the normal and reasonable flow of traffic." That leaves a lot more than four feet of space available for interpretation and judgment, but at least it signals the legislature's intent. The law also gives bicyclists the right of way over left-turning cars crossing their path — another provision already granted to motor vehicles and, by extrapolation, to bikes. It's all good stuff, and I hope these rules get through to the motoring public. The main road of bicycling season is not too far ahead." Dangerous act. Why would you let a driver pass someone on a double yellow line and a no passing zone to same a few second of driving time? This law is dangerous to farmers, cyclist, Sunday drivers and to the drivers passing them. When the drivers fines that they should not of passes they will go back into to lane hitting the person or head-on into another driver. Do people look at these laws before writing them? SB 781 Passing with a double yellow line; drivers allowed to pass a pedestrian, stopped vehicle, etc. Passing with a double yellow line. Allows drivers to pass a pedestrian, a device moved by human power, a stopped vehicle, or a vehicle traveling less than 25 miles per hour by crossing a double yellow line. The bill also relocates a definition from the end of the section to the beginning for clarity. Life is Good. Go outside and enjoy.